It’s December 26th, just a few days away from starting a new year. Most of us are spending a few days in our hometowns visiting our families. It’s that time of the year when it feels appropriate to do a quick update and take a look at the things we’ve accomplished last year. We’ve spent a good chunk of December getting started with translation. Our goal was to have the first four days of the game available in English on early January (this includes the events that take place those days AND a great part of the static elements that are in the game the rest of the days). As you’ve probably heard before, in “A Place for the Unwilling” we use something called Ink (made by Inkle) to handle all the logic of the dialogues. From blocking dialogue choices to relationships, randomization or even minigames. It’s one of the reasons why a tiny team like ours can create so much content. Ink blends narrative and logic, which is great and it’s the reason why you can get so much done with it, but it makes translation a bit trickier. A person who is translating the text for the game could accidentally add a new bug (and with all that content, testing isn’t quick either). Plus we also need to work along with translators to make sure they understand the very basics of Ink. It also makes our workflow more complex, it’s like keeping up with two versions of the game. If you change a detail you need to do that in the other language as well. These last weeks have been like testing the waters. We translated 35.000 words (as a reference, the first Kingdom Hearts had that exact word count) and we’re about to start implementing and testing them. So far it’s looking good, dozens of issues will probably come up during testing but, based on early evaluations, it shouldn’t be anything big. As we always say, there’s a lot of work left to be done (because every little change means going through a huge amount of content) and we aren’t ready to announce a final release date yet but, we’ve reached content completion and we’ve started localization. These are very exciting times. So that’s the more recent news, let’s take a look at 2018. We didn’t go to that many game shows and there was a very good reason for that, we were able to focus more on building final things for the game. When a project is in development a lot of time gets “wasted” on making specific demos for shows, while being at shows is great for many reasons, they still affect production. With the support of Kowloon, who are making sure we can do our best in this project, we could afford to spend more time working on final content. That was a huge milestone, for an indie team, having more resources changes everything. Though we only attended 3-4 shows, we’ve done our best to keep everybody updated, posting new things every 1-3 weeks and trying to answer each one of your messages. If we ever missed one of yours, we apologize for that. We’re three people working full-time and two more doing so part-time (doing everything, from the game to communication, business development and paperwork). We’re are building “A Place for the Unwilling” for you, hoping that you’ll enjoy the game and shape a community around it. And, while we can’t just show you everything and spoil the experience of discovering the game’s world, we want you to be on this trip with us. Helping us tweak the way we do things. Whether our updates are interesting or you’d like to see some other kind of content. Thank you all for your support, especially to those who believed in the project since the earliest stages. Hope you have a great time during Christmas. 2019 will be another year where we’ll be working very hard, but it’s the one where you’ll get to walk through the streets we’ve spent so many hours creating. Best wishes from the whole staff at AlPixel Games. Today we have some great news for you all. It’s been hard to keep it a secret over the last months, but we now finally announce we’ve partnered with Kowloon Nights to make sure we can give “A Place for the Unwilling” all the love it deserves. You might not have heard their name, after all, they have been keeping a low profile until now. But their team includes people with lots of years of experience and they have the resources to help projects like ours. Their initial line-up features some huge names, like Fumito Ueda or Teddy Dief, as well as many other names that might not be as famous but are equally amazing. We are extremely proud of being able to work together and appearing right next to all those games. They did their big reveal today, which means we can now speak about it (finally! ).You’ll find “A Place for the Unwilling” on some major sites. We’re featured on the latest issues of Famitsu and EDGE and there’s a chance we might appear in some other media soon. We wanted to clarify that, just like their website states, Kowloon Nights isn’t getting in the way of any creative decision. They give us feedback and help us in a lot of different ways but we’re still making the exact game we were making before. Only difference is that we can now reach more platforms (looking at you consoles), more people and have more resources to polish the game. These are huge news and we are really excited about what’s to come. So stay with us and don’t forget to check their other games because they all look great. Christmas is almost here. You know, that time of the year when we like to get introspective. Taking a look back at all the things that happened in 2017, it’s hard to believe it all took place in the very same year. We’ve been featured in showcases all over the world (Brazil, UK, Germany, France), received three award nominations and PCGamer included us in the list of indie games they’re most excited about. And what’s most important, the game is shaping up and getting better each day. Sure, it wasn’t all that great, each victory came after a struggle. There were many challenges we had to overcome and not just in terms of development. But we stood our ground and went through them. As you read these words we’re likely to be working on our new milestone, which is to finish a playable demo before the year ends. One that, for the very first time, contains all the major features and lets you play several days in the city. That said, we’d like to wish you both a Merry Christmas and a happy new year from the very bottom of our hearts. We hope 2018 brings us even more happy memories and that you all are here to celebrate with us. Hey everybody! Today we’re announcing a few changes regarding our devlog and the way we do updates. You know that, from the very beginning, we’ve wanted to be as open as possible with the community. For almost two years we have published updates every two weeks, as we felt that was a great way of staying in touch with you, but we should always try to improve things, so we’re making some changes that we believe will be quite exciting. We will no longer publish long wordy updates every two weeks. Updates will become way shorter, possibly containing just a gif or a couple of pictures and they’ll now be weekly. These updates will appear fist on our Discord server. Longer updates will only be posted occasionally (maybe every 1-2 months) and just when we feel we have enough content for them. Why are we doing this? Being in the middle of production means you’re no longer making big flashy decisions but just doing regular work. We’re also avoiding showing any kind of spoilers that might ruin your final experience. Long updates take a lot of time to prepare and, at this point, we feel a different planning will make more sense. In addition to updates being shorter and weekly, we encourage you to join our Discord server (which is basically a chat you can use from your browser). You’ll get access to sneak peeks and we’re always around, which means you can ask whatever you want about the game (or just talk about whatever comes to your mind). After running this server for three weeks we are sure it’s a really powerful tool to stay in touch with anybody who is interested in the game. Hold on! We still have a couple of extra announcements. In our previous update we launched a “Leave your mark” contest. Fans could either draw a new character or write a short tale about them. It was great to see what you all came up with and choosing a winner isn’t always easy. We decided to choose two creations, a drawing and a story. So congratulations to Mario Manzanares and Thriefty! You did an amazing job! Know that this is only the beginning, we’re gonna host frequent challenges on our Discord server (another great reason to join), but this time you won’t be competing for your own sake, but for the sake of your Discord group because,starting right now, you can join two of the factions that live in our city. I am addressing you today, with the blessing of our dear dignitaries, to beg for your help in a crucial matter. As you already know, our city is in a state of peril. The humble classes have lost their humility and we must remind them their place. We count with each and everyone of you. Because difference matters. To arms! In every street, square or tavern! By day or by night! Those pigs don’t rest and neither do we. All of you can contribute. If you are weak, keep your eyes wide open. If you’re tough, kick them in their wealthy nuts. Victory will be ours! Let’s kick those pig’s asses! 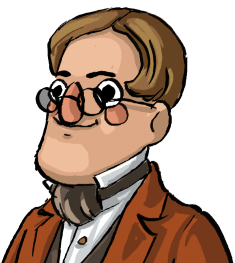 Today’s update is a quick reflection about how important testing is and why we needed to re-learn this skill while working in “A Place for the Unwilling”. Judging your own games is always hard. Game developers spend so many hours working on their projects and testing every little detail that they are no longer objective. With skill-based games, we are still able to determine whether or not some piece of content will be somehow interesting or not, even if we can no longer experience it as an average player. But this situation gets trickier with narrative games. It’s hard to feel any kind of engagement while going through a dialog you know by heart. You know how it’s going to be before starting, after all you’re choosing static options on a screen. When you’re creating new content from scratch you still have a sense of what could be exciting or not, you get a hunch of things that “would be cool to have”. But it gets tougher the deeper into the game you get (specially when you’re iterating). You’re checking content that is no longer fresh to you and even the most extraordinary event feels kind of mundame. User testing doesn’t get much easier, if you came by our booth during EGX Rezzed chances are we “interrogated” you after playing. That is because you learn a lot from watching players go through your demo (finding out what’s confusing or doesn’t work) but it’s really hard to tell how engaged they are or what’s going through their minds, most of the time you’re just seeing them silently pick dialog options while talking to NPCs. 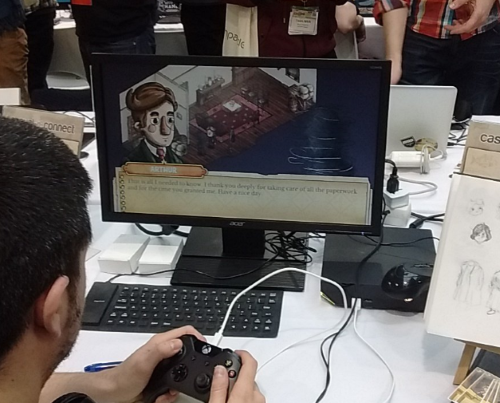 In skill-based games your players are facing challenges, struggling and finding solutions. So you’re receiving a lot more information just by looking at the screen. Even though we watch them play, we tend to focus on asking players questions once they’re done and chatting with them. When doing surveys is usually common to ask really specific questions such us “Was this piece of the puzzle easy to spot?” or “Was this challenge too difficult?”. While this method tends to work great when trying to spot interaction issues or balance tweaks, in “A Place for the Unwilling” we focused on more open questions. We asked players things like “What was motivating you to explore the city?”, “What characters did you meet?”, “What would you say about them?”, etc. That is because we’re really insterested in understanding how they see the city and the citizens, using more specific questions can end up giving away too much information and conditioning their answer (or even lead to misleading answers). We are used to attending shows, watching gameplays and getting feedback from players. But doing that very same thing with a narrative game requires some adaptation, it’s different from most games. At this stage of development user testing has been limited, but as we progress we’ll need to keep improving the way we handle getting feedback. And that ends this short rambling about something you might have not considered before about making narrative games. Hope you found it interesting. Stay tuned for the next update as we’ll announce the date of the streaming in which you’ll be able to check out the game and ask us whatever you want! Before delving into the update itself, we need to make a quick announcement. We usually publish updates at our Tigsource devlog, which is our main devlog, and also on our Kickstarter page. 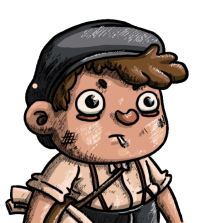 There are a few things we need to sort out and, in the meantime, we, AlPixel Games, do not have access to the Kickstarter account and can’t publish updates there. It may take a few weeks, so we are getting in touch with all the backers and telling them the updates will be available here for now. The City, with a capital “C”, a place so unique it doesn’t even need a name to be distinguished from the rest of cities because, why would you talk about any other? As impressive as it is, not too long ago soil and farms plagued what now is the centre of the trading world. One can only wonder how it managed to stay like that for so many years, but money attracts money, and when the first businessmen arrived, the rest followed. After a few years, the landscape had radically changed, and there was no going back. Buildings raised, ships started docking and the fog began to thicken. People had to change in order to fit in, and it wasn’t easy. The smallest of the apartments was already too expensive for them, and everything seemed to go up but salaries. Sickness, poverty and crimes became just another part of everyday life. As the city kept growing the factories appeared, roaring day and night while making the fog even thicker. As years passed more and more ships made of this place a mandatory stop in their routes. Big deals where closed and anybody, who was truly somebody, traveled to the City every once in a while. A mayor was elected and policemen were hired to make sure law was followed. An university was built and even a theatre, business weren’t the only thing on the rise, but so was culture. This is not a fairy tale, both evil and righteous people are hard to find and most of the souls in this city wear a grey mask. The pieces are always moving and stability is just an illusion. Over the last weeks crimes have increased, and the city’s most influencial families seem to have been chosen as targets. If you were to ask on one certain quarter you would be told it was those anarchists from the working class, while in a different part of the city the story would be quite different. But most people do not care about the other side of the story, or the “others”; perhaps this time the story doesn’t have just one or two sides, perhaps it’s not that simple anymore, and while most people focus on the battle, fumes keep coming out of everywhere, blending with the fog and making it thicker. 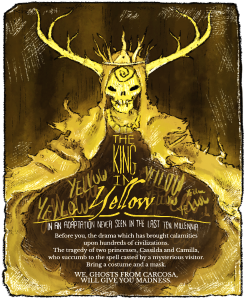 While all this happens the theatre wears a new dress, covered by posters, announcing the king’s arrival, for a new play is soon to debut in the City and everybody is talking about it, “The king in yellow” is coming to town. I do exist. There are others like me which are nothing but streets of empty buildings decorated with monuments and street lights, but that’s not my case. I have a body, but also a brain and a heart. I can feel people moving inside of me, I can hear hundreds of conversations taking place in my streets right now and even see beings from other realities. These are the shadows, you may call them people. They’re all different, but at the same time they look alike to my eyes. Sometimes, if I pay attention I can hear them whispering their names to each other, and once I hear them, I no longer see a blurry shadow, but an unique person with dreams and nightmares. These are the streets that shape me. Twisted paths where filth and plagues await in every corner. Some of the shadows live surrounded by luxury while others struggle to survive. Both God and Devil were born in my veins, and they never left. I have been feeling ill lately. There’s something inside of me that does not belong here. I don’t know how it entered or why, but it may be wise to fear it, the dark lurks even in the brightest places and nobody is safe. The following days will play a very important role in the life of the shadows. The pieces are already on the board and the game is about to start. Now, pick your move stranger, knowing that once it has begun neither of us will be able to stop it. There is only one thing that we can be sure of, it will be an interesting journey. Who knows? Maybe even I can die. 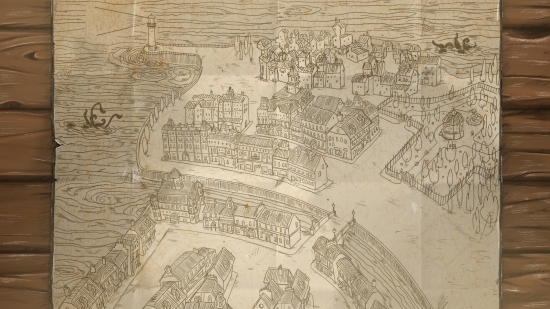 “A Place for the Unwilling” is a narrative adventure game where the city is the actual protagonist. No puzzles or “game over” screens, just you, the city and the dozens of stories which are taking place in there. Days pass and the fate of the city is yet to be decided. In terms of gameplay the game resembles “Pathologic” or the sidequests on “Majora’s Mask”(if you were to remove all the fighting and the time-rewinding). You’ll be free to explore the world around you and play a role in the events which will shape the future of the city. 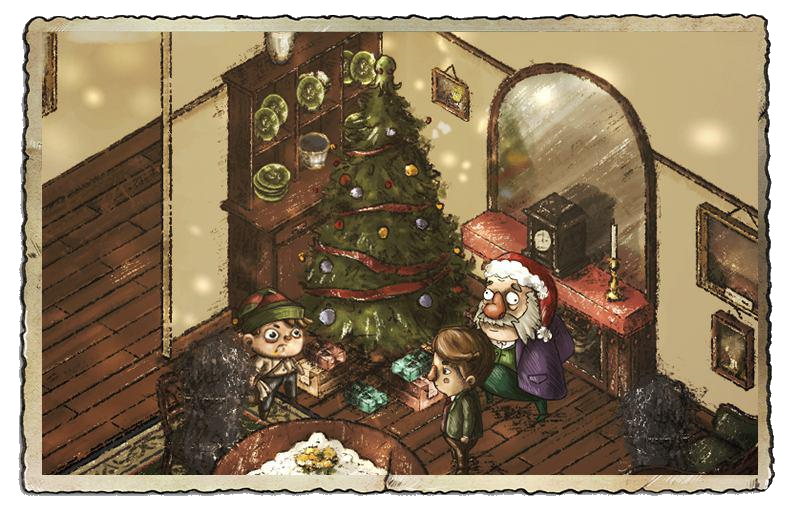 The game is being developed by “AlPixel Games“, the studio who made “Missing Translation“, a small puzzle game which won 4 awards and had 10 nominations. The team is being supported by GamesBoosters, which provides us with an awesome office to work, the opportunity to travel to several game events and their experience in the industry. From the start this piece became my favorite for a bunch of reasons – the use of brownish colors instead of our grey tones, by featuring and giving a charismatic touch to my favorite character in the game, the use of perspective with a friendly barmaid peeking in the background and finally the mysterious character entering the bar, cleverly hinted to be the human female character which makes our alien cowboy a flirty Don Juan! I love it! I think this piece sums up the game really well. A friendly alien trying to contact a foreigner who doesn’t understand anything of what he is saying… and cats who really don’t care about what’s happening and enjoy living the good life (as a side note, cats are the key to my personal theory about the game… ask Ludipe). In a moment of indecision it was the expression of the cat and the worried look of our main character that convinced me. It’s a really nice piece! In a completely different style of the other two illustrations, this manga-style pencil drawing feels a bit nostalgic to me, from the times I used to draw manga all the time during my teen years. Overall the scene choice is really cool, with the detail of the little tokens on the right, a hint to the game’s alternative ending. Look how peaceful she’s sleeping, contrary to our cat (here a kitten) who seems to be having some nightmares? Well done! There is something about this drawing that I find really funny. The expression on both characters makes me imagine all type of scenarios – he’s rude and completely ignored her, they argued, she’s shy and can’t find the courage to talk with him. The possibilities are endless! Meanwhile, cats are chilling on the roof, probably commenting on those dumb humanoids. It’s finally over! 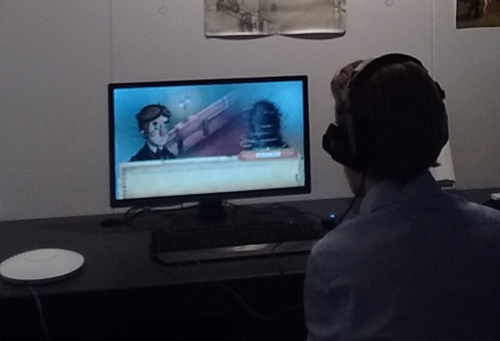 We’ve spent the last days showcasing “Missing Translation” at “Madrid Games Week”, a huge event which takes place in that little town where we live ;PThis event has a special meaning for us, since it’s the first place that featured our weird game. But events aren’t just about doing interviews and letting players check them out, there’s nothing like getting to spend more time with those awesome devs who we met just a few times each year. We even set up an “indie dinner” and about 150 people attended to the restaurant, that was craaaaaazy. We were so tired that we even had to take the day off yesterday, but we really enjoyed being there. “Made in Spain Games” took care of everything, prepared an incredible booth and brought together the Spanish indie scene. Thumbs up! Don’t go to far! We’ll announce the winners of our fan art contest soon and in just a few weeks we’ll reveal our next game, aren’t you excited?